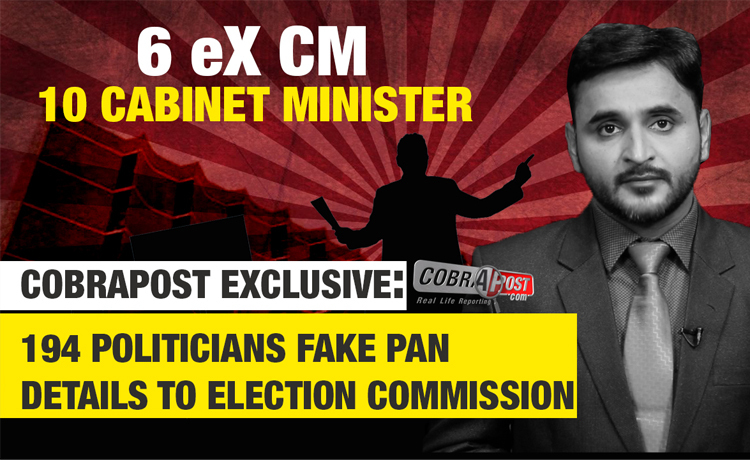 Cobrapost unearths data showing 194 Indian law makers from across the political spectrum, including 6 former chief ministers and 10 sitting ministers, faked their PAN details while reporting their income to the Election Commission. Among these honourables are 72 from Congress and 41 BJP, while almost all parties share this honour. Experts believe it may be just another ruse to hide the exponential rise in their income between elections and to evade tax . New Delhi (Thursday: 4 October): In a revealing analysis of about 2000 affidavits sworn before the Election Commission of India (ECI) by politicians across 23 states for fighting elections between 2006 and 2016, Cobrapost has found 194 politicians faking their Permanent Account Number (PAN) details. Under Indian law, a candidate is mandated to make due disclosures of criminal cases against him, and conviction if any, and his financial status. Candidates are required to disclose their income and assets by duly quoting their PAN issued by the Income Tax Department. Concealment of the same may invite disqualification under Section 125(A)(3) of the Representation of the People Act 1951 after a candidate is elected to the legislature. Section 139A(7) of the Income Tax Act 1961, on the other hand, clearly holds that “No person who has already been allotted a permanent account number under the new series shall apply, obtain or possess another permanent account number.” Of late, there has been a growing concern over such falsification of information with the Central Board of Direct Taxes (CBDT) investigating more than 100 lawmakers at the behest of the ECI. Even the Supreme Court of India has expressed concern over the use of forged PAN by millions of Indians, including law makers. The analysis throws up some interesting facts. For instance, the Election Commission does not verify the PAN details disclosed by candidates in their affidavits. In most cases, either of the two different PANs quoted is non-existent. It means the Income Tax Department never issued the PANs in question. In cases where the same PAN has been quoted in two election years, the said PAN was found non-existent. Of the total 194 deviations in PAN details, there are as many as 6 former chief ministers, 10 sitting ministers, 8 former ministers and 54 sitting and 102 former members of Legislative Assembly (MLAs) who have falsified their PAN details. Leaders of as many as 29 big and small political parties, including the Bharatiya Janata Party (BJP), Indian National Congress, Samajwadi Party, Bahujan Samajwadi Party, Janata Dal (United) (JD(U)), Nationalist Congress Party (NCP) and Hindustani Awami Morcha (S) among others, are involved in this duplicity. The BJP has featured a total of 41 times on the list, while the Congress leads the pack of dubious PANs with 72 leaders providing erroneous details. With 26 cases of incorrect reporting by politicians, Uttar Pradesh leads the pack. While Madhya Pradesh, Bihar and Assam have thrown up, respectively, 17, 15 and 13 cases, Uttarakhand has 14, Himachal Pradesh 12 and Rajasthan 11. Among the 41 BJP leaders to have faked PAN details, there are 13 incumbent and 14 ex-MLAs, 9 ministers, 1 Depute Speaker, 1 ex-minister, 1 ex-Chief Minister and 1 governor. The Congress has 13 MLAs, 48 ex-MLAs, 1 minister, 5 ex-ministers, 4 Chief Ministers, 1 Deputy Speaker. The SP has 1 incumbent and 11 ex-MLAs, the BSP has 1 incumbent and 7 ex-MLAs and the JD(U) has 3 MLAs, 1 ex-MLA, 1 ex-minister and 1 ex-MP in this list. After randomly examining the poll affidavits filed by politicians in between two election years 2006 and 2016, we verified their PAN details on the web site run by the Income Tax Department https://portal.incometaxindiaefiling.gov.in/e-Filing/Services/KnowYourJurisdictionLink.html. We found either of the two different PANs quoted by these politicians in their poll affidavits filed for two election years non-existent. This information can be had from another web site: https://www1.incometaxindiaefiling.gov.in/e-FilingGS/Services/KnowYourJurisdictionLink.html?lang=eng. We would like to put it on record that nowhere in this story do we claim all 194 politicians who have been found to have misrepresented their PAN details in their affidavits to the ECI have done so deliberately. Maybe out of human error there have been some erroneous entries, but it is hard to believe that all of them would have done so. The falsification of PAN details, in most cases, has been done by changing a digit here and there, probably to look like the original one and avoid immediate detection, and perhaps to take the defence that is an intentional typo. Experts believe that falsifying PAN details by politicians is a ruse to hide the exponential rise in their incomes, by not so legit means, and to evade tax. Another interesting fact that has emerged from this analysis is that some of the politicians involved in dodging the authorities have criminal cases pending against them. The data collated and analyzed by Cobrapost reveals big names. These include former Assam Chief Ministers Tarun Gogoi and Bhumidhar Barman, former Chief Minister of Bihar Jitan Ram Manjhi and and former Chief Minister of Himachal Pradesh Virbhadra Singh. Apart from these leaders, several sitting state and central government ministers, including Rajasthan minister Bina Kak, Bihar cabinet minister Nand Kishore Yadav, Maharashtra Minister for Public Works Department Deshmukh Vijaykumar, Haryana Minister for Women and Child Development Kavita Jain and Himachal Food, Civil Supplies and Consumers Affairs Minister Kishan Kapoor, have been found to have falsified PANs in their declarations of income and assets to the ECI. As our analysis reveals, there appears a direct correlation between the false disclosures and the growth in the income levels of many politicians, sometimes jumping manifold between two elections while their tax disclosures have become weaker, hiding more than they reveal. As controversies abound round their growing assets and wealth, experts say, they have resorted to this tactic which reflects in changes made to their PANs. Maybe some are using duplicate PANs, which is a common phenomenon, say some higher Income Tax officials, often used to evade tax, seek fresh credit and in most cases launder illicit gains into shell companies. 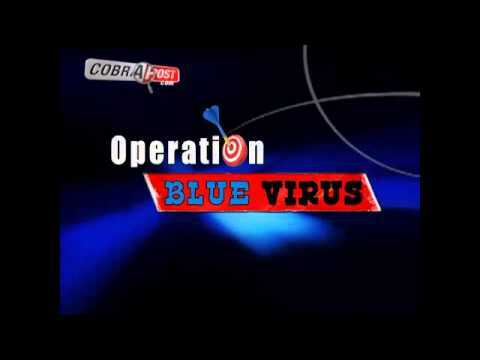 The cases picked by Cobrapost show a pattern in this behavior of our political class. For instance, three-time former Chief Minister of Assam and six-time Lok Sabha MP Tarun Gogoi has quoted two different PANs. According to the affidavit filed with the ECI for 2006 assembly elections, Gogoi had a PAN with number ACOPG06834, which did not exist, but in the next elections held in 2011 the Congress leader quoted a different PAN ACOPG0683M. However, the Gogoi family witnessed a phenomenal rise in their fortunes during the period between these two elections. Their declared assets included immovable property worth Rs. 3.65 crore and movable assets over Rs. 35 lakh in 2011 elections. Contrast this to 2006 when Gogoi had reported a total income of Rs. 5,92,580, as shown in his income tax returns, with movable assets of Rs 35.25 lakh, including among others, Rs. 14.77 lakh in the State Bank of India Guwahati branch, Rs. 3.91 lakh in the Daryaganj branch of Indian Overseas Bank in New Delhi, Rs. 11,920 in SBI Parliament Street branch in New Delhi (http://www.dnaindia.com/india/report-assam-assembly-elections-tarun-gogoi-and-his-wife-has-movable-assets-worth-rs-9983739-2192189). While declaring his assets in 2006 assembly elections, Gogoi’s predecessor and seven-time MLA Bhumidhar Barman had entered ACBPD0559N for his PAN which we found non-existing. In the next elections, we find him to have quoted a different PAN ACBPB0559N. Former Bihar Chief Minister and member of the Bihar Legislative Assembly since 1980 Jitan Ram Manjhi has misrepresented his PAN details. In his affidavit sworn before the ECI, Manjhi quoted his PAN as AKTPM06424H in 2010 elections, but he had a different PAN AKTPM0642H to swear by in 2015 elections. We found his PAN AKTPM06424H to be not existing. For Prem Kumar Dhumal, former Chief Minister of Himachal and BJP leader, falsifying PAN details is as much cosher. He quoted PAN AAKTD99648, which does not exist, in his affidavit to become eligible for fighting 2007 state Assembly elections. But in the elections held five years later, he found it convenient to quote a different PAN AAKPD9964E. Dhumal has five criminal cases pending against him under Sections 188, 186, 143, 499 and 500 of the IPC. However, the most curious case is that of five-time BJP MLA and four-time minister Kishan Kapoor from Himachal Pradesh. While filing affidavit declaring his income and assets before the 2007 state assembly elections, the senior BJP leader quoted his PAN as AFYPK8382G, but in the next assembly elections we find him in possession of a different PAN AFUPK8382G which is found to be non-existent. Interestingly, the minister is accused of indulging in not only in fraud but also in criminal behavior. In October 2013, Kapoor was booked by the Himachal Pradesh Vigilance and Anti-corruption Bureau, upon a high court order, under the Prevention of Corruption Act for fraudulently allotting a prime residential plot to his wife. As Urban Development Minister in the Dhumal government he then headed the Himachal Pradesh Housing and Urban Development Authority. Kapoor has nine criminal cases of serious nature, including kidnapping, wrongful confinement, rioting, criminal conspiracy and criminal intimidation, charged under Sections 171, 365, 147, 149, 342, 120B, 171, 506, 34 and 341. Kapoor’s former cabinet colleague Khimi Ram too falsified PAN details. Like her party colleagues, BJP leader and cabinet minister from Haryana Kavita Jain has quoted two PANs – AASPJ1161D and ACSPJ1161D. The first PAN, AASPJ1161D, was found non-existent. The case of former Chief Minister of Himachal Pradesh and senior-most leader of the Congress in Himachal Virbhadra Singh is no different when it comes to making false declarations before the ECI. While swearing affidavit for 2007 elections, Singh had a PAN ALPRS6513N, which was replaced by another PAN ALRPS6513N in 2012. We found his earlier PAN ALPRS6513N to be non-existent. The four-time Chief Minister, seven-time MLA and five-time member of Parliament (MP) too has been accused of laundering money to the tune of Rs. 7 crore by the Enforcement Directorate (ED), with the Special Judge finding prima facie merit in the charges labeled against him by the ED. In addition, the Congress leader, and his wife, has also been charge-sheeted by the CBI in a disproportionate assets case (https://www.thehindu.com/news/national/pmla-ed-files-charge-sheet-against-ex-hp-cm-virbhadra-singh/article22618580.ece). Raosaheb Shekhawat, Congress MLA from Amravati, Maharashtra, although a greenhorn in politics, has a trick or two up his sleeve when it comes to dodging the authorities with regard to his income declaration. In his sworn affidavit submitted to the ECI before the 2009 state assembly elections, Shekhawat, also known as Rajendra, quoted his PAN AAOPS5785J. But his 2014 assets declarations carry a different PAN as AAOPS8785J which does not exist. In 2012, the former Congress legislator hit the headlines when Rs. 1 crore worth hard currency notes were seized from his car during state civic polls held in February that year. Shekhawat’s declared income increased from Rs. 5.32 crore in 2009 to Rs. 11.11 crore in 2014. Although it includes the income of his spouse, the rise of almost 100 percent is considerable. But the question is why he should falsify PAN details to declare his income? Does this hide more than it reveals? Four-time NCP legislator from Madha in Maharashtra Babanrao Shinde also falsified PAN for making declarations before the ECI. Shinde used a HUF (Hindu Undivided Family) PAN AAPHS9430Q while filing his nomination papers for 2009 elections, but for his 2014 election he quoted HUF PAN AABHB9430Q to make the declaration of assets. However, his HUF PAN AAPHS9430Q does not exist. Controversies are no stranger to Shinde, either, whose family make their fortune in liquor manufacturing business. In 2013, the family of Sharad Pawar acolyte was accused of stealing water from Ujani dam for their distillery at a time when the state was reeling under severe draught (https://www.ndtv.com/india-news/drought-hit-farmers-allege-sharad-pawars-partymen-are-stealing-their-water-517463). Then in October 2016, the state Excise Department revoked the license of his family distillery, along with another baron’s firm, accusing them of “illegal sale and disposal of 23,227 litres of country liquor”. However, some months later in February 2017 the Maharashtra government rescinded the order to restore the license of both distilleries, while the cases were still pending with the Bombay High Court (https://indianexpress.com/article/india/maharashtra-action-on-sugar-baron-mla-kins-firms-revoked-4508407/). Another sitting minster from Maharashtra to have misreported PAN while declaring his assets and criminal cases pending against him is Deshmukh Vijaykumar Sidramappa. The BJP MLA from Solapur City North has quoted different PANs – AADHV5252L and AQOPD2749M – in his declarations. Sidramappa has five criminal cases pending against him, charged under Sections 143, 341, 147 of the IPC. The Income Tax Department has not issued him PAN AADHV5252L. 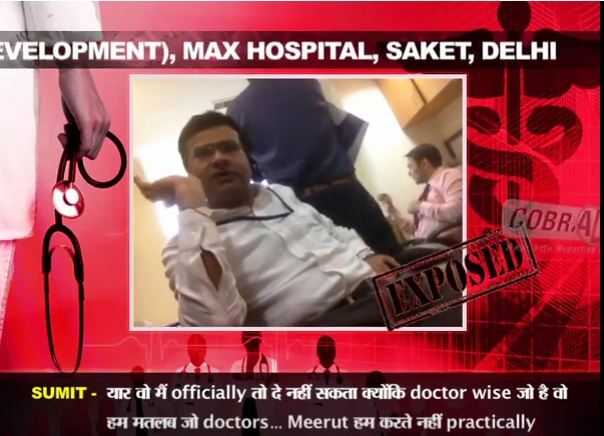 The case of former Haryana Health Minister and Congress leader Rao Narendra Singh is no less curious. While making his declarations in 2009, Singh had a PAN AIDPS2060F, which does not exist, but in the next state assembly elections held in 2014 he quoted another PAN AIBPS2060F. In between these years when Narendra Singh was Haryana Minister of Health, his tenure was mired in what came to be known as “cash for CLU scam.” The scam blew on his face when on November 9, 2013, Indian National Lok Dal (INLD) released a video showing him demanding money for grant of permission to change land use (CLU) in Palwal district. Two months earlier, the INLD had released a video showing some legislators of the Congress party demanding money for CLU. An inquiry into the scam followed and after the BJP came to power in Haryana, an FIR was registered against the scamsters including Narendra Singh in January 2016 under the PCA Act (https://www.tribuneindia.com/news/haryana/crime/haryana-vigilance-books-5-ex-mlas/189699.html). Narendra Singh’s tenure as state Health Minister saw another controversy when his department suspended the Narnaul civil surgeon in June 2013. While condemning the suspension as “unwarranted and unfortunate”, the Haryana Civil Medical Services Association accused the minister of punishing the civil surgeon for refusing to change the list of selected candidates to be hired on contractual basis under the National Rural Health Mission (NHRM) and appoint his cronies instead (https://www.hindustantimes.com/india/doctor-suspended-for-not-acceding-to-minister-s-demand/story-iWK5t5cV8QoIOCdgDzoISM.html). The three-time Congress MLA has over a decade or so seen his fortunes more than double. In 2005, Singh had reported his assets to be more than Rs. 2.24 crore. His declared assets registered more than 100 percent jump to Rs. 5.26 crore in 2014 (http://myneta.info/haryana2014/index.php?action=affidavitComparison&myneta_folder2=ha2009&id1=269&id2=442). In this long list of politicos falsifying their PANs, we have a prominent BJP leader from Uttarakhand, three-time MLA and two-time cabinet minister Madan Kaushik. The 52-year-old resident of Haridwar was elected to state Assembly in 2007 which catapulted him to prominence as his win came with a cabinet berth. He was elected from his home constituency again both in 2012 and in 2017. In 2007, Kaushik swore his declarations using PAN AOCPK7727K, which does not exist, but he had another PAN AOCPK7727G for 2012 election. Kaushik’s party colleague from Madhya Pradesh Paras Chandra Jain is also found misreporting his PAN. The five-time BJP MLA from Ujjain and four-time minister in various BJP governments since 2005 used PAN ABNPJ7597F to declare his incomes and assets before the ECI in 2008 elections. But in the next assembly elections held in 2013, we find him to have used another PAN ABNP37797F. We found both PANs non-existent. In sync with his rise in status both in the party and in the government, Jain’s income and assets also grew three-fold between 2008 and 2013. In 2008, Jain had declared income and assets to the tune of Rs. 1.41 crore, which quadrupled to Rs. 5.40 crore in 2014. Like other politicians who are drunk on power, Jain has also been accused of impropriety as Minister of Energy and New and Renewable Energy. He is alleged to have bent rules to grant a massive contract worth Rs. 180 crore to install solar plants in the Ujjain division in 2016 to Infinit Energy Solutions, a firm owned by his daughter and daughter-in-law (https://www.indiatoday.in/india/story/madhya-pradesh-energy-department-awards-contract-to-kin-of-power-minister-paras-jain-1049181-2017-09-21). Former JD(U) MP from Bhojpur and Buxur Anil Kumar used PANs AEWPK48904 and AEWPK48909 to declare his income for election years 2006 and 2011, respectively. We found both his PANs non-existent. His party colleague, sitting JD(U) MLA from Bhadurpur, Darbhanga, Bihar, Madan Sahni quoted his PAN as BIDP59714C and BIDPS9714C, respectively, for 2010 and 2015 election years. Cobrapost found both these PANs not existing. Former SP MLA from Milkipur, Uttar Pradesh, Anand Sen quoted a non-existent PAN AAYPY883D for election years 2012 and 2017. These revelations assume significance considering the Central Board of Direct Taxes (CBDT) is investigating 98 MLAs and 7 Lok Sabha MPs for discrepancy in their assets and declared sources of income. Last year the CBDT apprised the Supreme Court of its investigations into the assets of 42 MLAs and 9 Rajya Sabha MPs, in response to a petition filed with the Court (https://indiankanoon.org/doc/51782092/). The submission was made in response to a petition filed by an NGO Lok Prahri, which sought scrutiny of the election affidavits of 26 Lok Sabha MPs, 11 Rajya Sabha MPs and 257 MLAs on the ground that their assets had increased substantially between two polls. While the assets of 320 MPs, the petition said, who were re-elected to the Lok Sabha in 2014 had grown by 100 per cent, 6 MPs had seen their assets rise by over a whopping 1000 percent and that of 26 MPs by 500 percent. Similarly, a large number of MLAs had also reported a steep rise in their wealth. While the petition was being disposed of in the apex Court, the issue of bogus PANs became a point of hot debate with the judiciary expressing it concerns. There are 10.52 lakh “bogus” PAN cards of individual assessees floating around which the Court said was “not a minuscule number” (https://www.deccanchronicle.com/business/economy/110617/1052-lakh-bogus-pan-cards-cannot-be-termed-miniscule-number-to-harm-economy.html). So far, 11.35 lakh duplicate or fraudulent PANs have been detected by the authorities. Taking into account what the phenomenon entails for Indian economy, the Court observed: “It could harm the economy and create adverse effect on the nation.” Former Attorney General Mukul Rohatgi submitted as much before the Court bench that duplicate PANs were used to funnel cash into shell companies. The Court, however, did not go beyond expressing its concern. The BJP-led NDA government also just twiddled its thumb. “Despite the Supreme Court refusing to institute an inquiry into the phenomenal rise in the wealth of the politicians named in the petition, the government should have taken initiative on its own to let the nation know how they all get so rich between elections if they are really serious about bringing transparency in political life of the county,” observes S. N. Shukla, CEO of the Lucknow-based Lok Prahari. Non-disclosure of information may attract penal action under Indian laws. Under Section 272 B of the Income Tax Act, 1961, there is a provision of penalty Rs 10,000 for submitting a false PAN. But the penalty can go higher in cases involving tax frauds or tax evasions, ranging from 100 percent to 300 percent of the tax evaded, sources in the Income Tax Department say. Having dual PAN cards can also lead to prosecution usually in the event of tax evasion, money laundering and tax fraud. Section 125A of the Representation of the People Act, on the other hand, makes concealment of information a punishable offence with “imprisonment for a term which may extend to six months, or with fine, or with both”. Some of the leading electoral reforms experts say a deviation in disclosures made in their affidavits by politicians is a matter of “grave concern”, as there is possibility of a fake or duplicate PAN being used to funnel illicit cash in poll campaigning. It is also a way to suppress income and wealth disclosures while putting a protective layer of ambiguity over corporate donations to the candidates’ party. “We are concerned about such weak PAN disclosures and duplications found in the exercise. There are serious ramifications to this issue and it has already been flagged off to the EC by our teams in the past,” said economist and member of the Association of Democratic Reform (ADR) Ajit Ranade. The ADR had in its report (https://www.ndtv.com/india-news/rs-384-crore-donated-to-political-parties-without-pan-details-says-adr-1738884) released on August 16, 2017 highlighted the lack of PAN disclosures in donations made to the national parties. 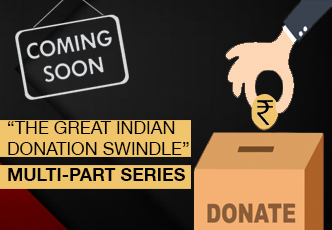 The report noted that even though a pre-requisite, not many of the 1933 donations, totalling Rs 384 crore, were made with disclosure of PAN details, despite a court ruling making it mandatory to filling out affidavit without leaving any sections blank. Similarly, no part of the Form 24A submitted by political parties with details of donations above Rs. 20,000 can be left blank. The parties are also obligated to provide details like the name, address, PAN, mode of payment and amount contributed by each donor who has made a donation above Rs. 20,000. The ADR report found these procedures were overlooked in most cases. The PAN was a casualty when it came to making disclosures of political donations. But while the civil society is seeking intervention in this regard, few know that the Election Commission does not bother to even verify if the PAN details given by the candidates are correct. Jadeep S. Chhokar, retired professor of IIM Ahmedabad and founding member of the ADR, says, “It is utterly shocking, but not surprising, that the Election Commission does not verify the faking of PAN details by politicians.” In fact, we have been demanding for the past so many years that at least their financial matters are verified within six months they are elected to the legislature so that corrective measures are taken to bar them from legislative duties, he says. “When the Commission does not verify such information how they can prosecute them,” he wonders. Sunil Arora, Election Commissioner, does not agree. “It is not our mandate to verify the information provided by a poll candidate. We simply put the information in public domain for other agencies or individuals to follow up.” Former Chief Election Commissioner S.Y. Quraishi, who created a poll expenditure division in the ECI in 2010, is categorical, “Yes, the Election Commission should have a mechanism to verify PAN details provided by candidates and the CBDT should take necessary follow-up action.” But at the same time, the Election Commission cannot take over the CBDT’s responsibility, he adds. But this averment begs a question: Shouldn’t the Election Commission fulfill its constitutional obligation by at least verifying such information and disqualify an elected representative for falsifying information? The Supreme Court, while delivering its judgment on the petition in June last year, red-flagged all such issues of concern of non-compliance of disclosures at a time when forging or cloning PANs has become a flourishing business, with police authorities clamping down on such rackets in Mumbai, New Delhi, Chennai and Kolkata, among several tier-2 cities. Earlier this year, the Mumbai Crime Branch arrested (http://www.thehindu.com/news/cities/mumbai/accused-made-hundreds-of-fake-aadhaar-pan-cards/article22746105.ece) two persons involved in a card-cloning racket and forging driving licenses, Aadhar, PAN and voter identity cards, among other vital documents. 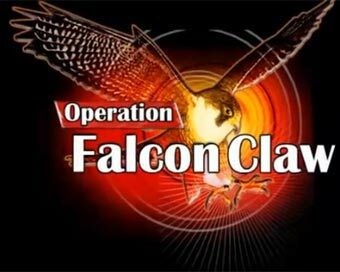 The modus operandi of the racketeers was different in New Delhi where the criminals had involved Income Tax officials. The strategy was to enroll a freelance data entry operator in the Income Tax offices to get access to IT computers, otherwise secured with a distinct user ID and password. The access was used to forge original PANs of thousands of users. 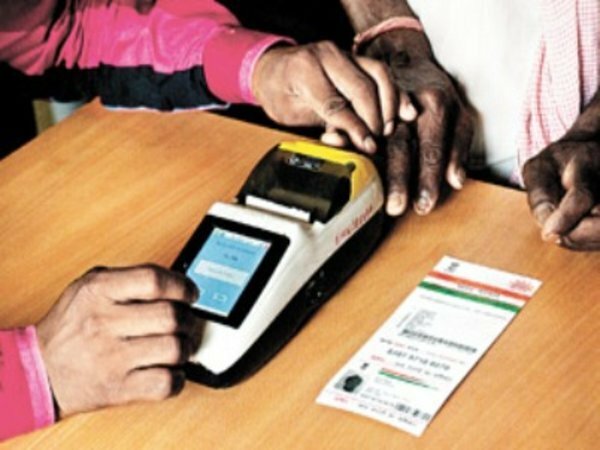 Last year the Pune police arrested a data entry operator, and two accomplices, who was helping pepper fake voter identity cards and using the same to make forged PANs while working on contract out of the District Collectorate (http://www.sakaltimes.com/pune/three-held-making-forged-voter-id-cards-4216). In 2015, the Hyderabad police found 400 PAN cards obtained illegally by “bribing the government officials” and also by taking advantages of evident loopholes in the tax system (http://www.thehindu.com/news/cities/mumbai/accused-made-hundreds-of-fake-aadhaar-pan-cards/article22746105.ece). Curiously, notwithstanding the apex court’s concerns, last month the CBDT reportedly asked the ECI to not disclose the scrutiny of assets declared by lawmakers in their poll affidavits to the public (https://indianexpress.com/article/india/cbdt-to-election-commission-dont-make-scrutiny-of-mp-mla-assets-public-5230884/). Maybe the CBDT also wants to toe the official line of the government which has made political donations impervious to public scrutiny (https://scroll.in/article/832522/in-name-of-transparency-bjp-wants-political-parties-to-get-anonymous-corporate-funds). It is obvious, says Shukla, the government is shielding the corrupt politicians. 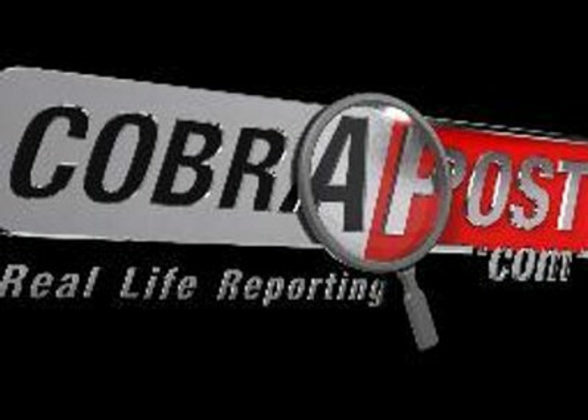 Cobrapost has not independently verified claims made by other news organization quoted in the story. India’s political class would pout such answers while cocking a snook at the law. We received reply to our query from the following politician. As and when we receive any more replies, we will post the same on our website. To view email reply click here.